Quite a while ago, a chance remark I made on Twitter led to a much longer – and to me very worthwhile – private discussion about eating chickens, sorrow, and ethics. I have admired my friend Tegan Bennett Daylight‘s writing on this blog more than once – and, I understand from first-hand accounts (I’m away again so couldn’t be there! ), she led a transfixing session at the Sydney Writers’ Festival today with the internationally renowned literary critic James Wood, along with Australians Jane Gleeson-White and Geordie Williamson. Tegan wrote the piece in my posted link, which was about the time she and her family saved one of their chooks, which had become very ill, by giving it human antibiotics. It is a beautiful, moving little essay; read it, you’ll love it. Of course when the chooks were taken by the fox, Tegan was terribly upset for some weeks.These chickens were the second pair embraced by the Daylight family, after the first, immortalised (and much better named) here, were returned to Rentachook because the rented garden they were destroying had to be saved. But their replacements, Harriet & Fluffybum, lived happily for a couple of years in subsequent Daylight backyards and were definitely beloved pets. I hasten to make clear that the question was posed in the most pleasant and respectful way – indeed, the asker explained to our mutual friend that she liked my writing a great deal, and was genuinely interested in my position but didn’t know how to ask me herself without seeming confrontational or aggressive. Our mutual friend asked her permission to send it on to me, and she agreed. I decided to post my reply here, because I think it’s a great discussion to be having, and as I say at the end, I was very glad of the question – and particularly the way it was asked, in a genuine spirit of inquisitive sharing of information. It’s a shame so much ‘debate’ between vegans and meat-eaters isn’t initiated in such a charming manner as my correspondents did. I should add that they both replied with great warmth and pleasant thanks for my time in responding. Anyway – here’s my response. I have bolded a few sections for emphasis here. I would really like to ask her why the deaths of these chooks are sad but not the deaths of the chickens she cooks with and eats? I guess my first response is to figure out what I was sad about when Tegan’s chickens were killed by the fox, which in itself has about three answers. First and most of all I was sad not for the chooks but for my friend, who had grown very attached to the chooks and was deeply upset by the violence of their deaths. She was sad, so I was sad. Her children, interestingly, were not nearly as sad as she was, though seemingly just as attached to the ‘personalities’ of the chooks, which surprised me. Second, I was sorry about the possibly extended period of terror that the chickens themselves experienced – it is awful to think of that kind of fear, though obviously as a meat eater I am directly responsible for the fear many animals experience immediately prior to their deaths. So I definitely did feel sad about the manner of the death of the chooks. The fact that they were sort of ‘pets’ of course – though kept in the first place for their eggs, which is another morally troubled area for vegans – had led me to a more sentimental emotional relationship with those two particular chickens than the chickens I eat, which are bred purely for food. However, I actually don’t think the two sets of chickens are as emotionally and morally separable as you are assuming I do. The second part of your question is about the chickens I cook and eat myself. When I cook at home, I only use poultry from a supplier called Feather and Bone here in Sydney, who I believe work very hard and honestly to source meat from places that raise and treat the animals as ‘ethically’ as possible. I know where the farms are, who runs them, that they are regularly inspected by individuals I trust to measure the producers’ commitment not just to raising animals in a ‘humane’ way but to caring for the land and water and air on which those animals live. I feel a fairly similar level of sadness for those chickens as I do for Tegan’s chickens, to be honest, which is all about the moment of their deaths. 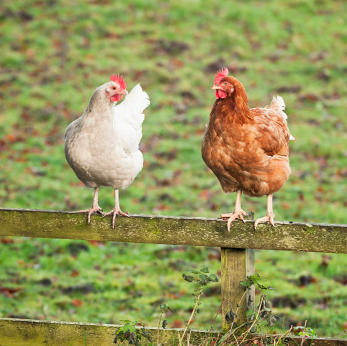 I feel that both sets of chooks lived similarly pleasant lives until the hour of their deaths – well fed and watered, able to indulge their natural instincts, free from disease or illness, living in the open air and the sunshine and given shelter from the elements and (at least as much as made humanly possible) predators. And I feel sad that each chicken has a period of fear (I assume) before their death. At the same time I think the deaths of the meat chickens is quicker and involves a shorter period of physical pain than the deaths at the jaws of the fox. If any of these chickens was living a ‘natural’ life in the wild, it may well live a significant portion of that life in blind fear of predators and possibly in malnourishment, with injury, disease, etc. I absolutely respect the fact that as a vegan you will find my position untenable, and believe that any animal being killed for food is by definition unethical, but I guess that is where we would simply part ways. I don’t believe it is morally wrong to kill animals for food, any more than I think it is morally wrong to kill the snails that eat my herbs, or the mosquitoes that bite me, or cockroaches that run round my kitchen. I think humans are a part of a food chain and a life cycle of the planet, and that to enact my part in the food chain in a reasonably carefully considered way does not make me an immoral being. I do believe it is wrong to senselessly kill animals, to hurt them without cause and to allow them to live in terrible suffering, which is why I am pretty strict about where I buy my meat, especially chicken and pork which I will only buy from F&B, because I think the intensive farming of those two animals is worse than farming of grassfed cattle and lamb that – in Australia at least – usually spend a good portion of their life in a free range situation. That said, I very rarely buy any meat from providers other than Feather and Bone, including lamb and beef. Fish and seafood is another whole very grey moral area for me – because of the environmental degradation caused by fish farming and the overfishing of oceans. I know some people who won’t eat mammals for ethical reasons but will eat seafood. For me the destruction of habitats and ecosystems is as much a morally charged decision as the ‘saving’ of a single animal. And yet I want to eat fish, so I do. As I hope you can see, I am well aware that as a meat eater I am subject to my own hypocrisy almost every day, most especially when I eat at the houses of friends who don’t know or necessarily care – though most of my close friends think about this a lot too – where their meat comes from. I would never refuse to eat a meal someone has made an effort to cook for me, no matter where the meat comes from, because at that moment I believe my moral obligation to appreciate and show gratitude to my loved friend or family member outweighs my moral obligation to the animal. I suppose underlying all of this is something you may find abhorrent: I am quite at ease with the fact that all living necessitates the death of other creatures. All of us, whether we eat meat or not, are involved in countless deaths every minute of every day. The death of other people – through our inaction to those in war-torn, famine-scarred countries and so on – upsets me more than the death of other animals. And yet everything I do as a wealthy white woman is at the expense of another human life, somewhere in the world. There is a very difficult line that we all walk between the right to live a good life ourselves and the obligation to help others have a good life. For me, the lives of animals are definitely on this spectrum, but the spectrum is very long, and I walk an uncertain line back and forth and up and down and across the blurry centre of it all the time. For me the core issue that determines my behaviour about animals for food is motivation, and the reason for the killing. I would never knowingly harm an animal – including a fly or an ant or a spider – if I didn’t feel there was a practical imperative for doing so. Killing cockroaches to prevent a cockroach infestation of my house feels to me like justifiable homicide. Same goes for mice or rats. But I try to find a method of killing that is instant – like squashing or instant-death traps (sorry) – rather than poisons or things that kill slowly and painfully. If I find a spider I leave it be or carry it outside. I kill snails in my garden because the snails and I want to eat the same food, and I get to win. Killing chickens for food I don’t believe is wrong. I believe it is a part of the natural life cycle of the planet, and my sharing this food with other people increases their wellbeing and connection to each other and the planet. I don’t waste any part of the chicken (for example making stock from the bones) and I believe I do feel grateful to the chicken that has lost (I’m not stupid or hypocritical enough to say “gave”) its life. But going back to the original question of my apparent inability to “connect” the death of Tegan’s chooks with the death of the other chooks I eat, there is another important point to make. I am guessing you don’t share this phenomenon, which is fine – but for me it is completely possible, and acceptable, to experience more than one feeling at a time. Daily, I have conflicting, even quite contradictory, emotions at the same time, about lots of things (this is experienced by anyone who has ever hated their mother at the same time as loving her). If Tegan had killed the chickens and served them to me for dinner I would quite happily have eaten them, in the knowledge that they had a good life and did not suffer until the final moments of life. I would also have been grateful to my friend whose mental, physical and emotional energy went into the meal that she was offering me. And yet I could also in that moment feel sad for the chickens, that they were no longer alive. I guess the shortest possible answer to your original question is this: yes, I am a hypocrite. I have long, long ago accepted that any feelings of moral superiority I ever have about the way I try to live my life are basically unjustifiable as soon as I look at the way someone else lives theirs. And while I am often tempted to feel quite smug about my own food choices (which I’m sure must make you gasp in disbelief) compared to some people I know, I also try to remember this quote whenever I want to give them a lecture about the terrible life their roasted chicken has lived. There are a whole lot of other ways in which I feel that my food choices actually enhance the lives of people and some animals – the pigs and chickens I cook would not have any life at all if it wasn’t for being produced for food, and for the most part they have very pleasurable lives until the ‘one bad day’ at the end. I believe even Peter Singer agrees that to exist is preferable to not existing, though I am sure there are many qualifications to be made about that. Well, gals – I am sure you weren’t expecting such a long rambling answer. It probably sounds defensive – although I hope not – and I hope it hasn’t bored you both to death. But I wanted to be careful in my answer because I do think about these things, as do many meat-eaters I know. I think it is a mistake to assume that if someone eats meat it’s because they have never bothered to think about the moral implications of doing so. And I am also really glad you asked the question and sent the email, because it does me good to recalibrate and reconsider this stuff all the time, each day. And to try to make the rightest decision in that moment. As I said above, my correspondents replied with warmth and gratitude for my time in replying, and we all patted each other on the back and parted ways. But I do think about that email often, and am glad I was asked the question. It keeps me, not so much on the straight and narrow, but on the track of a mindful consideration of how we eat, how we view ourselves, and how both of these things can ripple out into the world in meaningful ways.